It's time to be inspired and to inspire others. Let's get right to it with these great features. Oh, and if you missed the most viewed links in the post before this check it out to see if it was you. This landing and gallery wall turned out beautiful by The Endearing Home. My favorite soup is tomato basil and I will have to try this version by Barns and Noodles. Don't these look yummy? 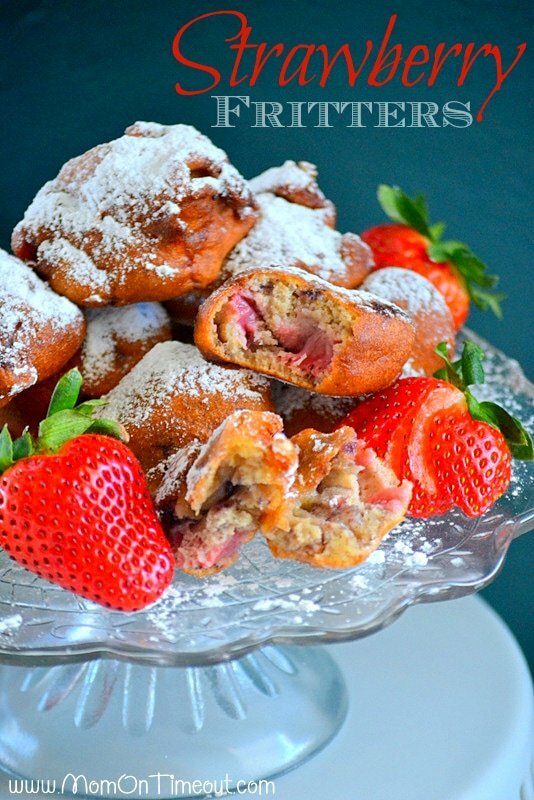 Strawberry fritters recipe was shared by Mom on Time Out. Some of these blogs are new to me and may be to you, too. Be sure and check them out. If you were featured be sure to grab a "featured" button from my sidebar. Thanks for hosting the party, Kim. Looking forward to visiting the link ups later tonight! Happy day to you! Thanks so much for hosting your fun party! Great features Kim. I'm happy to be back! Thanks for the feature Kim!! And thanks for hosting as always! Lovely features, thanks for hosting Kim! Hope you're having a great week :) Thanks for hosting! Wonderful & delicious features this week! Thanks for hosting! Kim, thanks for being so gracious as to continually host this party. It's one of the highlights of the week! Thanks for hosting Kim. Love, love, love the features, as usual! Hello Kim: Thank you for hosting the party for us this week, and what a lovely batch of features you've selected--all so beautiful! Thank you so much for the feature Kim! Off to check out some of these awesome links! That tomato basil sop looks so good. Love all the features. I didn't know if I would be here tonight. The blog was really slow this morning. The issue is resolved and it's loading fine now. No idea what happened. It was Typepad blogs. Kim, thanks for hosting another great week of inspiration. Gotta try those strawberry fritters. So happy to be joining in! Thank you for having me, Kim! I am sharing the winter picnic you had on Family Day; Let us not wish away the winter, but celebrate the season. Thanks so much for hosting - love the features! Thanks so much for hosting, Kim. Great features this week, as always. Have a wonderful week. Thank you so much for the lovely party every week, Kim...they just keep getting better every week! Hi Kim. Thanks for hosting. Gorgeous features!! Thank you so much for hosting! Have a wonderful week. As always, it's amazing to see what everyone has done. Those recipes look delicious! Thanks for hosting, Kim! So many great links! Thanks for hosting! Thank you so much for hosting! Enjoy your evening. Great features, Kim! Thanks for hosting. Thanks for hosting Kim. I love that chair redo feature. Hi Kim - Great features. Love the chair makeover - the fabric is so pretty! I will be giving the Tomato Basil Soup a try - sounds perfect for this cold weather we are having. Thanks for hosting the party. Great features Kim, I'll be checking out the ones I missed. Hi Kimmie! Oh, I'm getting more intimidated each week seeing all of this wonderfulness. Thanks for hosting your party. Hey Kim, thanks so much for hosting, always love coming to your party! Love those features, especially that mirror makeover! Thanks for hosting. Have a great week! Hi Kim! Thanks so much for hosting your very popular blog party for us. Those are great features that you chose...just amazing. Un partage de sublimes photos. J'ai beaucoup apprécié celles de la cuisine. Thanks Kim for hosting...LOVE the features! Fantastic features Kim! Thanks for hosting! Hi Kim, I was so excited to see my gallery wall featured on your post, you made my day! I absolutely LOVE your blog and your beautiful home, have been following along for years! The best party in blogland. Thanks, Kim. Always a great party! I love Carmel's landing spot. Nothing to share this week - hopefully next week - but always love browsing the lovely links! Thanks for hosting Kim! Thank you so much for the feature! How fun! Thanks for the feature Kim! Off to check out that tomato soup recipe -it's my fav too! Thanks for hosting! This is my first time linking up with you. That mirror makeover is fabulous! Thanks for hosting Kim. So many pretty and delicious features! Kim, I get on your blog and get so distracted. I linked up last evening and then saw several posts I wanted to read... then I read your winter sunroom post (beautiful)... then I viewed a few posts on your sidebar (love your easy frenchy southern style)...and totally forgot to leave a comment and thank you for WOW... and letting me get lost in the great posts on your blog!So, thank you on both accounts! Hi Kim, Hope thanks as always for the great party. thanks for hosting, Kim! hope you're having a great day! I'm sitting here laughing at the blog name Barns and Noodles...I love it and wish I'd thought of it! Once again, amazing transformations by talented bloggers. I have a question for you. I'm thinking of moving my cottage look cream colored tables to my living room for a lighter look for spring/summer. My sofa and loveseat are brown leather, so I hadn't thought of mixing 2 such different looks...but, I think it just might work as my lamps are dark and my vignettes could be a mix of both. Thoughts? That Ikea kitchen is amazing. Kim, thank you so much for hosting! It's been several weeks since I've been able to join your party. My post today is a little different--it's about several projects I've started and one unusual one that I've finished. I hope that's okay! Kudos to you for not allowing people to post to the party without a backlink to you. It's kind of sad that you had to take this step--why would people not link back to the party?? I'm guessing people just link to so many parties that they forget about it. But you deserve a link back to this party. You provide so much traffic to so many people; a link back is only fair and courteous! Love your features Kim~ thanks so much for hosting!! Lovely party Kim, as always I so enjoy coming here for a visit. I think you have the biggest party every week!! That chair makeover is gorgeous! Wonderful features, as always Kim. Thanks for hosting. Have a great weekend!